For those of us who can remember being given it free at school, milk is a little bit more than just a healthy drink. It is a right — a tangible, drinkable, drain-the-bottle example of the state looking after its children. That’s what a government is supposed to do for its young folk isn’t it? Everything it can to help them grow up to become strong, healthy, energetic workers. Along with cod liver oil and the strange, syrupy orange juice concentrate they used to give us, milk feels healthy. I’ve grown up with the notion that whenever I drink milk I’m doing myself good. I read all these stories about how long kids spend on their X-boxes and I always think: “They should drink their milk”. It’s like a care-all for life’s ills. And it has played a disproportionately large part in my journey towards being a man. For reasons I could never fathom, teachers at my school would only allow girls to be milk monitors. I think it was something to do with her thinking that boys would hash and bash the milk crates about. And, to be fair, the metal crates filled with bottles did make a sound satisfyingly like a window smashing when dropped on to the cold stone floors of a school corridor. So, with child logic, being told I couldn’t be a milk monitor made me want to be a milk monitor. Their powers were limited, of course. Their only real hold over the rest of the class being that they could choose in which order to give out the bottles. But at an age when everything, and I mean everything, is a competition, whether you got the milk first or last in the class was a big deal. We’d race to drink the milk as quickly as possible and if the vindictive Angela or snobby Susan chose to deliver your row’s milk last you’d never win the drinking race. It was a matter of some distress to me if I didn’t win the milk drinking race and I’m not sure I’ve ever truly got over the trauma of being handicapped by unfair distribution practices. But when I got to secondary school, milk grew into a huge part of my life. I was old enough then to give up my paper round (which only paid 80p for a six-day week) for a milk round, which paid an eye-watering £4 for two hours of hard graft between 5 and 7am, seven days a week, plus the collecting round on a Friday night. But having a milk round was the zenith of working class male boyhood employment standards. We were tough. We had to be. Up at 4.45am (a lie in of an hour on a Sunday though) and out on the vans. It seemed everyone had a pint or two delivered to their doorstep back then. 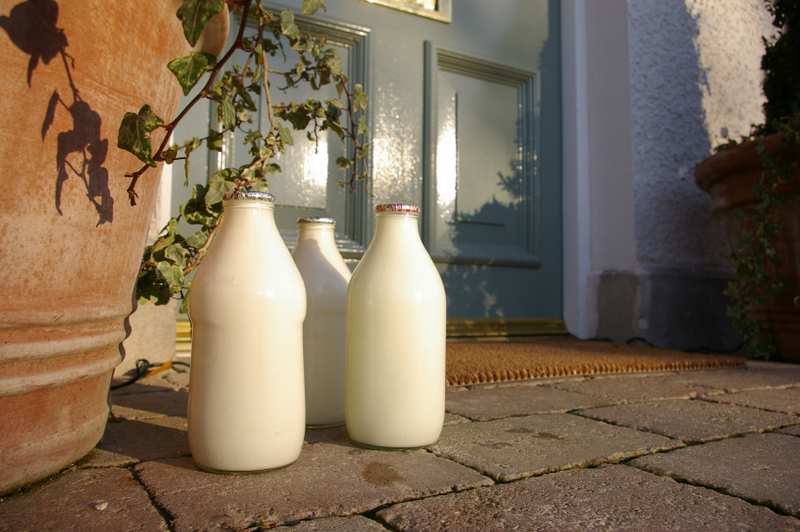 I remember wondering about the few houses that we didn’t deliver to, pondering the thought processes of the poor, weird folk who didn’t drink milk. The van had a step on the back and would drive around the housing scheme dropping we three delivery boys off every few hundred yards. We had hand-carriers that took six bottles each, one in each hand, but sometimes had to take a bottle under each arm if one of the houses took a particularly high number of pints. The van didn’t stop, it merely slowed down. We were expert at stepping off backwards, so we hit the road facing the way our momentum was taking us. It was like slowing down from a run. If it sounds dangerous, that’s because it was, I suppose. But it never felt dangerous. We’d then deliver to all the houses, each order memorised, and catch up with the van. Depending on what sort of house it was, you could climb walls or jump fences between gardens so you didn’t have to go all the way back to the pavement which would slow you down. Being slow wasn’t appreciated if all the other delivery boys were back at the van loading up for their next set of houses a hundred yards down the street. In summer, when the birds sang and the sunrises were glorious it was great to be alive. It was a bit less fun in winter, of course. But this was a great job. If it was T-shirt weather we sprinted from house to house. We all drank a pint or two of milk as we went round. Looking back, we must have been the healthiest boys in town. Up early every morning for two hours of intense exercise, helped by a couple of pints of milk, before getting home (with another pint we’d swiped) ravenous for a bowl of porridge before running off to school. I think such an exercise regime would kill today’s teenagers. We drank full-fat unpasteurised milk but there wasn’t a pick of fat on any of us. I played football every day, or manhunt, or cricket, or just generally ran about. I am positive that the four years I spent, from age 12 to 16, doing a milk round and drinking gallons of the stuff, gave me an inbuilt stamina that I still benefit from 40 years later. Milk, I love it. It was always the white stuff for me.